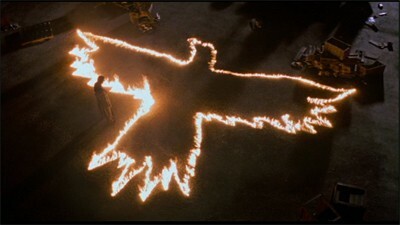 A dead man walks in Alex Proyas' The Crow, both on narrative and literal levels considering the ill-fated death of Brandon Lee during filming. There's a macabre allure in watching that juxtaposition -- a man whom wasn't alive upon the film's theatrical release playing a character who himself has risen from the grave -- and some attribute the film's cult stature almost purely to the fact, lifting its poignancy on the shoulders of misfortune as a form of elegy to an up-and-coming star. Debasing the film's accomplishments simply because of that does a disservice to the vision that the director stitched together, though, a forerunner to the temper that would later rise in the filmmaker's work. Proyas' shadowy artistic eye makes itself readily apparent in this tensely-paced, gothic revenge film, where a clear perspective on an evocative manner elevates the straightforward narrative into a bleak but beautiful flight across the smoky horizon of a dangerous city. Based on the comic series by James O'Barr (with liberties taken to soften some of the source's edge), The Crow uses the platform of a typical vengeance film and invokes a horror-laced twist and a focus on anger-driven action. The story starts a year prior to the core events, where a young couple are murdered -- the girl, Shelley (Sofia Shinas), brutally raped -- on the evening before Halloween (their wedding day) by a pack of thugs involved in a crime ring concerned only with leaving the city in flames. Police detective Albrecht (Ernie Hudson) takes a personal interest in the case when he sees the pain suffered by the couple's friend, teenager Sarah (Rochelle Davis), whose neglectful mom works at a nearby bar. 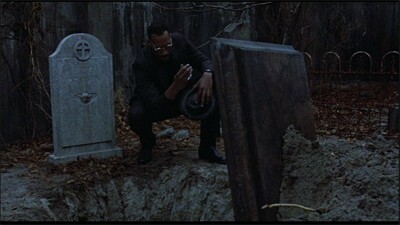 Nearly a year later, approaching the anniversary of the event with the assailants still on the streets, a mythical crow arrives on the gravesite of Shelley's would-be husband, guitarist Eric Draven (Lee), and resurrects him for two purposes: to even the balance by killing the thugs -- and their boss (Michael Wincott) -- and to mourn his wife. Equipped with invulnerability and the ability to see through the crow's eyes, he sets off. Morose, slathered in black and white jester make-up, and donning a leather body suit, Eric takes to the city's billowing rooftops as an undead karmic force, to which Alex Proyas dresses the city in shadows that give it a distinctive approach -- and reflect on the hero's melancholy state. The director draws clear influence from Tim Burton's Batman and the textured production elements of Andrei Tarkovsky's Stalker (not in deliberate pacing, mind you), feeling comfortable in his ability to focus on details moving in rich darkness; watching Eric sprint across the byzantine roofs with the crow hovering above offer iconic and captivating bursts of vigor, showing a deft eye for cinematic geography. And once Eric and the city's denizens enter into the nasty interiors of the buildings that he's gallivanting across, the broodingly-orchestrated design latches onto fractured mirrors, gothic neo-religious steeples, strobe-lighting, and the tattered mausoleum of Eric's apartment, all depressive and involving amid low-budget opulence. Proyas' design attempts to mirror the bleak tone that O'Barr constructed in the books, which carries over into the The Crow's stylized momentum where, one after another, the tables are turned on Shelley's murderers. The source material revels in angered, melancholy tones that revolve around O'Barr's troubled mind-frame at the time of their writing, and that plays a key part in Eric's acts of revenge; his use of knives, needles, and explosives in cars touches on a twinge of smart abrasiveness, yet it's never too heavy-handed or grueling to be entirely off-putting -- just a little. Raw energy stirs in The Crow as a result, backed by a deftly-orchestrated soundtrack featuring a wealth of familiar names from the '90s. Sometimes tracks performed by power bands tend to stand out like a sore thumb in the context of cinema, but Proyas sinuously incorporates their liveliness into the design; while covers from Nine Inch Nails and The Cure impress as pulse-pounding standalone tracks, they also aptly bolster the film's furious, grungy flow. Brandon Lee's gaunt, high-expression face and strapping frame create an ideal embodiment for the rocker-turned-vigilante Eric Draven, as he seamlessly molds into the reverential comic style that Proyas' orchestrates. He delivers the heavy downhearted dialogue with an exaggerated theatricality that fits with The Crow's thick gloom, his painted-white face and wide eyes giving him an almost ethereal property. While there's certainly a lot more to admire in the film that just Lee's halted potential, it's worth noting that this very well could've been his vaulting-off point as an action star; he gives and takes punches with emphatic force, poises himself with firearms -- especially during a large-scale shootout in a nightclub -- with mesmerizing intensity, and he lends palpable gravity to quieter, reflective moments when he's not doling out the wrath stirring in the character's dark soul. He effectively creates a character out of Draven that's lost in his own grief and acting on his pain, but isn't a sulking sad sack. One could argue that The Crow operates on style over substance, where the ominous emotional texture engulfing the action lacks a multifaceted story. That's partially true, in a nearsighted sort of way, but it discovers enough lyricism in its stirring tragic environment to fill the void left by a straightforward tale, especially enough for a vengeance picture with deep-rooted fantasy elements. As the cinematic rush carrying Proyas' adaptation arrives at its final brawl atop a rainy, gargoyle-laden rooftop, the foreseeable but pointed catharsis it finds becomes captivating because of the marriage stricken along the way between artistic intentions and the heavy crescendos of action. While the special effects have aged -- well enough not to be scoffed at, though, still artistically captivating -- and the aggressiveness of its violence has been trumped by PG-13-rated imitators, the inspiration behind The Crow's stark vision elevates it beyond being only a memento mori of its primary actor, even if it admirably does that, too. 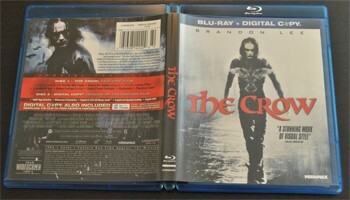 The Crow finally swoops into the domestic home-video market as part of the Lionsgate-Miramax licensing partnership, arriving in a two-disc presentation: Disc One as the fully-equipped Blu-ray, and Disc Two simply containing the Digital Copy. Fitting, heavily-designed artwork, using lots of filters and featuring Brandon Lee in his full gear with the crow logo in front of him, adorns the cover. The Crow is a very dark film, one with judicious color usage only where it's absolutely necessary: neons in an arcade, crimson red of flesh, and the heavily-muted usage of tans in clothing and skin-tones. Lionsgate's 1.85:1 1080p AVC encode handles the deep shadows in contrast and low-lying palette with a steady hand and a skillful eye for detail, only showing a few scattered hiccups in compression noise and rugged depth that's rarely egregious or off-putting. The thickness of Proyas' artistic slant looks appropriate to its original intentions while its grasp on faint details and color tonality in shots takes a robust step-up from its standard-definition counterpart. Moreover, the budgeted production work, from the costumes and the crime lord's den to the intricate church and Eric's rooftop-to-rooftop vaults, looks smashing at 24fps and with a clear eye for the gothic darkness. There are, however, some discrepancies between this transfer and previous visual renderings of the film, specifically in comparison to Miramax's standard-definition release from 2001. Certain scenes hold a different balance of contrast and color -- the pale lightness of certain white levels, the blistering dark-room redness during flashback sequences, and flesh tones being the main culprits -- that often interchange looking better and worse in terms of The Crow's intended look. Similarly, certain scenes are framed quite different; primarily, you're going to see more headroom in the DVD, which, again, occasionally either appears appropriate or deserving of inquiry, often looking somewhat tight in closer-quartered shots. The simple fact is this: the heightened color gradation, exquisite contrast balance, and far-cleaner print greatly exceed any slight questions one might have about the print, as Proyas' film looks exception in Lionsgate's Blu-ray release. Impressively, the DTS-HD Master Audio track trumps the visual treatment, showcasing an impeccable ear for both the nuance and explosiveness in the moody, rasping sound design. First, the music: every beat, drum blast, and electric guitar and bass strum from the tracks hits every note clean as a whistle, tapping into the bottom-level bass and mid-range twangs everywhere it needs. Explosions, gunfire, and and the slinging of knives retain the piercing punch that they need, full-throated and eager to encompass the listener in its action-movie energy. Then, the more subtle sound effects arise, and they're where the track really impresses: searing of fleshy items in a hot plate, the flip-open of a zippo, and the crackling of glass under feet and in the hands of Eric. Verbal clarity carries its '90s age with buoyant clarity, and the rear-channels receive plenty of activity through echoing blasts and rainfall. In short, it's a few steps above what's to be expected -- an aggressive knockout. Hey, whoa, wait ... so there's the audio commentary with Proyas we've been waiting for. And he starts it out with a bang, busting out of the gate talking about correcting myths regarding the making of The Crow. He eases up a bit, though, delving into the low-fi special effects (no models! ), doing something subversive with the superhero comic/movie genre, and some cross-fertilization between it and Dark City. 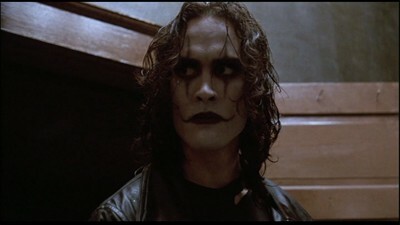 Naturally, he discusses Brandon Lee, covering the attributes that made him so pitch-perfect and dedicated to the role, going into the tactics he used to make his costume look extra-rugged, while he also chats about the movie's off-hand relation to The Hudsucker Proxy and his fascination with cities at night. Proyas isn't modest here, with his attitude teetering between refreshing and somewhat boastful; he's not shy in mentioning that his film started something of a subgenre, him being instrumental in the "rebirth" of the goth culture, and feeling his artistic "embellishments" were important. The whole track is an exceedingly good listen, and Proyas certainly explores the film to a degree that'll satisfy its fans. Good news and bad news regarding rest of the supplements though, and if you've been following many of Lionsgate's recent Blu-ray releases, I probably don't need to say much more: (most) everything from the standard-definition DVD from 2001 has been carried over to this release, with nothing new added and no high-definition mastering being done. The Commentary with Jeff Most and writer John Shirley has been ditched in lieu of the director's commentary, but that's the only non-DVD-ROM feature that hasn't been ported over. The Behind-the-Scenes Featurette (16:32, SD MPEG-2) employs plenty of interviews from the cast (including Lee) and crew, as well as James O'Barr, and it goes to fine lengths talking about the production/artistic elements and staying faithful to the comic, while A Profile by James O'Barr (33:33, SD MPEG-2) allows the comic writer to verbalize his history to great extent. Extended Scenes (11:32, 16x9 SD MPEG-2) and a short Deleted Footage Montage (5:23, 16x9 SD MPEG-2) reveal some of the excised material from the film, while Production Stills, Storyboards, and Poster Concepts flesh out the remainder of the disc. Finally, we've got a vintage Trailer (1:30, 4x3 SD MPEG-2). 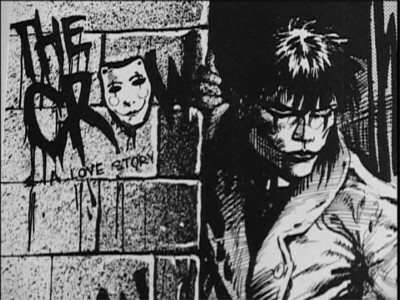 The Crow might sustain its cult stature as a fond remembrance of Brandon Lee's burgeoning career, but there's more underneath the low-budget adaptation of James O'Barr's comics than that. Alex Proyas' visually arresting use of a shadowy dystopian city, practical effects to render the arhitecture, and robust action set-pieces combine with this simply-told but emotionally eloquent story of love-driven vengeance laced with fantasy-horror, stitching together vivid gothic lyricism that's gripping to behold on several levels. Sure, one of those levels isn't for an elaborately-written story, but the central concept of an undead revenge-seeker evening the balance by killing his fiancee's assailants proves to be a compelling-enough cornerstore for the melancholy visual style to command as its own substance. Lionsgate's Blu-ray exhibits complete respect for the film's dark nature, dealing out an extremely strong visual transfer that preserves the shadows and low-saturation filters, while also following through with an explosive Master Audio track and a slate of strong extras -- including a strong commentary from Proyas and many recognizable behind-the-scenes and deleted stuff. Highly Recommended.